David Pocock is back for the Brumbies. 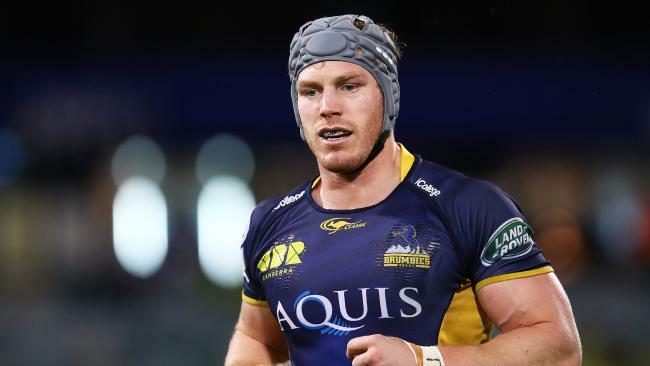 SUPERSTAR David Pocock will play his first Super Rugby game since 2016, having been named in the Brumbies' starting side to host the Waratahs in Saturday night's crucial derby at Canberra's GIO Stadium. It will be the Wallaby flanker's 100th match of Super Rugby, after racking up 69 appearances for the Force before heading to the capital in 2013. Pocock missed last season as he took a sabbatical and also sat out the early rounds this year as he recovered from knee surgery. The 29-year-old replaces Tom Cusack at openside flanker in the only change to the starting side from the one that beat the Sharks before the bye. For the Waratahs, blockbusting winger Taqele Naiyaravoro will make his first start of the season. Naiyaravoro scored two eye-catching tries off the bench in the win against the Rebels before the Waratahs enjoyed the bye last week. His promotion comes at the expense of outside centre Lalakai Foketi, who drops to the bench, with Curtis Rona moving from the wing to the No.13 jersey. Halfback Jake Gordon returns from concussion and replaces Mitch Short in the only other change. "One of the things that we've been trying to get this year is some go-forward," Waratahs coach Daryl Gibson said. "With Naiyaravoro in that line-up, it provides us with an opportunity to use him more as a go-forward option and then also see what Curtis can provide at 13. "Statistically, he's been one of our most dangerous attacking players and it's one of the things we've been struggling with - getting good gain line." Israel Folau will remain on the wing and Bryce Hegarty at fullback. "Every team has to have a point of difference," Gibson said. "For us, we've got one of the best aerial catchers in the world (Folau) and we need to employ that tactic to force teams to try and counter that. "And off the back of that, try and look for opportunities. "So it's not only looking for Israel in defensive positions catching the ball, but also forward positions. "It's something we haven't utilised well in the past and it's a tactic we'll continue to keep using."